The author explains how Jesse James faked his death and lived out his final years under the name James L. Courtney. 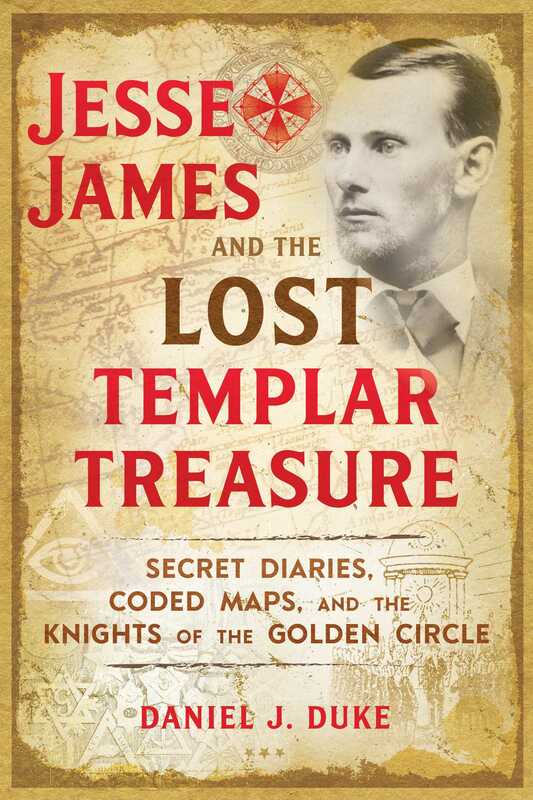 He uncovers James’ affiliation with the Knights of the Golden Circle, a secret society that buried Confederate gold across the United States, and shows how the hidden treasures coded into James’ maps were not affiliated with the KGC but with the Freemasons, the Knights Templar, and the treasure of the Temple Mount. Using sacred geometry, gematria, and the Kabbalistic Tree of Life symbol, the author explains the encoded map technique used by the Freemasons to hide and later recover treasures, an esoteric template known as the “Veil”. He shows how the Veil template confirms the locations of Jesse James’ recovered treasures in Texas as well as other suspected treasure locations, such as the Oak Island Money Pit and Victorio Peak in New Mexico. Tracing knowledge of the Veil template back through the centuries, the author reveals the Veil hidden on the cover of a 16th-century book that contains a secret map of the New World and the “hooked X” symbol of the Knights Templar. He shows how the template was used not only to hide treasures but also sacred knowledge and relics, such as within the Bruton Vault, which originally contained secrets tied to Francis Bacon, the Freemasons, the Rosicrucians, and the founding of the United States. Applying the Veil template alongside the esoteric secrets of Poussin’s famous painting, Et In Arcadia Ego, and Cassini’s Celestial Globe, Duke shows how the template reveals other Templar and Freemason treasure sites scattered throughout America and around the world. Shortly after my mother’s book on Jesse James came out, we were contacted by many people armed with stories of Jesse James, treasure, or sometimes both. Most of the treasure stories, after a little research, turn out to be tall tales, but there are a few that turned out to be true. One of those true stories came from a man by the name of George Roming from El Paso, Texas. George Roming, a 32° Freemason, Shriner, and World War II veteran, was born in 1920, not far from where Jesse James aka James Lafayette Courtney lived in the small and rural farming community of Buttermilk, Texas; later renamed Blevins. As a young boy and later a teenager, George would walk past Jesse’s farm and when Jesse saw him, he would invite him to sit on the front porch and talk for a while. They got to know one another and Jesse trusted him. In the 1930s, Jesse had George swear an oath of secrecy and hired George to help him move 700 bars of gold. He said they transported the gold in a large wagon to a ranch owned by one of Jesse’s friends, approximately twenty miles away. They buried the gold in a rectangular shaped field. They found the center of the field and from that center, Jesse paced forty steps to the north and instructed them to dig a hole approximately eight feet in depth. They lined the bottom of the hole with large timbers, unloaded the gold into the hole, covered it up and left. George drew a map for us on a piece of brown paper and described to us exactly where they buried the gold. The place he described is now under a lake which was created in 1954 by the United States Army Corps of Engineers. When I informed George that it is now covered by Lake Belton, he gritted his teeth, looked down and shook his head in disappointment. George Roming died in 2007 at the age of 86. He was a good man and a good friend. A little more than a year after we met George Roming, we were contacted by Nita Callahan. Ms. Callahan was associated with former Texas State Attorney General, Waggoner Carr, and she wanted to show us the locations of two treasures that had been recovered. The first site was located approximately 2.5 miles west of the Williamson County, Texas, courthouse located in Georgetown, Texas. It was said to have held a very large cache of gold bars weighing close to eighty pounds each. When I returned home I pulled out the maps and started drawing lines. As I stated before, the line from Victorio Peak to the Bruton Parish Church is 1,715 miles long. I then drew a line from Victorio Peak to the site near Georgetown, Texas. That line is 548 miles long and the angle off the main line (the line from Victorio Peak to the Bruton Parish Church) is 33°. Not only is the number 33 associated with Freemasonry but it also happens to be the number of Bacon, as in Francis Bacon, when using gematria along with the alphabet of his time, the Elizabethan alphabet. The second site Ms. Callahan showed us was located to the northeast on a property next to a cemetery almost 1 mile south/southwest of the main intersection in Little River-Academy, Texas. While the treasure that used to be located on this site was smaller than the one in Georgetown, it was said to have been worth millions of dollars in gold alone. We were told that a railroad track was laid there and used to unload the treasure into an underground vault. The remains of the track were clearly visible and the earth around the location of the recovered treasure was marked by a large depression. Although the treasures had long since been recovered, knowing the locations provided valuable information which could possibly help in locating the treasure indicated in my great, great grandfather’s (Jesse James’s) map. Each time I learned of a treasure site I would plot the location on a map and work with the Knight of the Golden Circle template to see if it fit or not. It was not until just over a year later, when I learned of yet another treasure site, that it all started to fall into place. This alleged treasure site is located on the outskirts of the small town of Tow, Texas, located on the eastern side of Llano County, near where the Colorado River runs into Lake Buchannan. One of the stories connected with this treasure is that a mule train carrying a government payroll was ambushed and the gold was brought to this location and deposited. It is said to be “booby trapped” with a water trap; the water being provided by the nearby Colorado River. Now, in addition to the Victorio Peak and Bruton Vault sites, I had four treasure sites in Texas to work with. If the sites are connected, then what is the connection shared by my great, great grandfather Jesse James (aka James Lafayette Courtney), Albert Pike, Francis Bacon, and the Spanish? If they are connected, then there must be a common link. The only answers I had-- and even thinking it felt as if I were going way out on a limb--was Freemasonry. If Freemasons were responsible for burying these treasures, then the next obvious question would have to be why? What purpose could they or anyone else have for burying so much wealth? Looking back through history we can find many examples of why someone or some group with so much wealth would feel the need to bury it for safe keeping. One such example of a group with great wealth one day and almost completely wiped out the next is the Knights Templar. Daniel Duke, the great-great grandson of Jesse James, grew up surrounded by stories of lost outlaw treasures. For more than two decades he has researched the mysteries involving his family, Freemasonry, and the Knights Templar. He lives in Texas.